Powdered dairy products in bulk. Packaging in a protective atmosphere occurs more and more in the food industry to extend the shelf life of the products. This technology is often used in the dairy industry when packaging powdered dairy products which contain unsaturated fats. The most important reason is to delay or even prevent fat oxidation. Fat oxidation can be curbed or prevented by reducing the oxygen content in the product. Oxygen is usually replaced by nitrogen or a mixture of carbon dioxide and nitrogen. The oxygen content can be limited by flushing the product with a gas or a gas mixture that contains no oxygen. The most efficient solution for this is to remove the oxygen by vacuum technology and to then flush or inject the product with an inert gas: nitrogen. The nitrogen is blown into the powder until the packaging is atmospheric again. The theoretical values for the quantity of residual oxygen in relation to the vacuum reached are stated in the table at the bottom of the page. Indigo Engineering has developed a turnk ey solution for the evacuation and gassing of filled Big Bags. The system is used after the Big Bag has been filled so it works off line from the Filling Station. The installation carries out the whole process of sealing, evacuating, gassing, inspections and control of the achieved results and disconnection. Big Bags are required for this turnkey solution that have been designed for this purpose with a special multiple EVOH liner and sealed connection for connecting the Big Bag to the system. This sort of Big Bag has been designed in close collaboration between Indigo and the manufacturer of Big Bags. 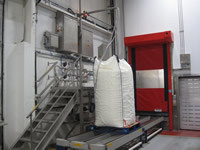 The system can be implemented with one or more positions for connecting Big Bags depending on the required production numbers. Very low residual oxygen percentage after longer shelf time. Gassing to the core of the Big Bag. 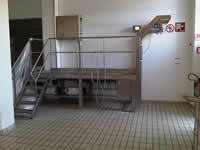 Rebuilding of the existing drying tower and filling line is not required. Can be flexibly used along with existing system. Gassing of the packaging itself instead of pre-gassed product. It is always possible to carry out the process again in the case of errors, less waste. Much lower investment than for inline gassing. When the Big Bag has been filled, the filler opening is hermetically sealed by the sealing unit specially developed for this kind of Big Bag. It can be placed directly next to the filling line or included in the offline gassing system. After sealing, the Big Bag is connected to the system and, after starting, the process runs fully automatically. Built-in measurements in combination with process software accurately control the evacuation and gassing cycle for, among other things: leakage, cycle time, sub-cycle times, pressure differences, powder carry over, atmospheric pressure, nitrogen system pressure, dosing time and dosing pressure. An alarm will be generated or the process will be interrupted the moment measuring values or controls deviate from the pre-set menu. The process can be comprehensively followed on the touch screen. Various pre-set menus can be produced and designated per type of powder and filling volume. This way it is easy to change the recipe. Many milk powder manufacturers already use this system where packaged powder is made that has to keep well for several months for the purpose of export or for bridging internal product changes. Prominent milk powder producers in The Netherlands, France, Austria, Ireland, Poland and Germany have already been using Indigo Engineering for years, particularly for infant food. Ask our customers about their experiences.